Speed, Loads and now with your friends! 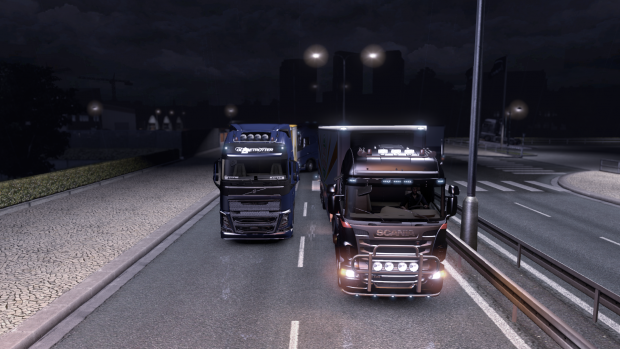 ETS2MP is a mod in alpha for the game Euro Truck Simulator allowing you to participate in convoys with people from all over the world on our Global Servers! Make new friends as you venture around Europe ensuring that you stick to the time limits or your company might get a fine! Trucking could never be more real, however don't forget mistakes can cost you! With over 600,000 registered users and 6,000 online at once, you'll never be alone. You can either power around Europe on your own or you can join one of many Virtual Trucking Companies created for the ETS2 community, with the CEO able to buy and sell trucks, hire and fire drivers you need to keep up the good work or face the sack! Will you cope? "Deliver the goods with your friends"